Macs are relatively hassle-free—most people can get by without doing any routine maintenance at all. But you can greatly reduce your chances of problems, both big and small, by regularly performing a few simple tasks. I recommend performing some—such as backing up your data—diligently and often. Others require your attention only occasionally. For tips for getting your computer set-up right in the first place, see “Essential Mac Maintenance: Get set up”. Wondering how you’ll remember what to do when? Download the Macworld Maintenance Calendar, import it into iCal, and then customize it to fit your situation. You’ll never forget your maintenance chores again. There are two types of people: those who’ve lost data and those who will. So perhaps the most important step you can take is to accept the fact problems are inevitable and make sure your safety net is in place. Leopard’s built-in backup system, Time Machine, makes it very easy to keep copies of your work. I use Time Machine to automatically back up all my personal data. (See “Time Machine tips and troubleshooting” for details about how to get started.) But I also create a bootable clone—an exact copy of my hard drive—using Shirt Pocket’s $28 SuperDuper 2.5 ( ), and update it each day. If my Mac’s hard drive ever bites the dust, I can boot off of the clone and be up and running in no time. (With SuperDuper, you can even keep the clone and your Time Machine backups on the same external drive.) In addition, I keep a backup in a different location, in case disaster strikes my office. For more information about how and why you might combine Time Machine with other backup methods, see “Is Time Machine all you need?”. If you don’t use Leopard, see “Easy Mac Backups” for help developing a backup plan. Schedule Apple Updates Keeping OS X and other Apple software up-to-date is easy. Choose Software Update from the Apple menu, and this built-in utility will launch and then check Apple’s servers to see whether any new Apple software is available. If it is, you can choose to install those updates right then and there. Alternatively, tell Software Update to check for updates automatically: Open the Software Update preference pane, click on the Scheduled Check tab, and select the Check For Updates option. Software Update can check daily, weekly, or monthly and, if you like, automatically download any updates. Keep Other Software Current Many third-party programs—Microsoft Office, for example—have a similar feature that automatically checks for new versions and lets you know you when one is available. You’ll often find this feature in a program’s preferences window (typically accessed through the program name: Preferences menu item). You can also find out about updates at companies’ Web sites, but if you have lots of third-party programs that don’t check automatically, a better approach is to take advantage of a site, such as VersionTracker.com or MacUpdate.com, that maintains a free, up-to-date list of software updates. A membership with either site ($50 per year for VersionTracker, or $40 per year for MacUpdate) buys you regular e-mail alerts about updated programs, as well as software that tracks updates for the programs installed on your Mac and even downloads the updates for you (see “Track New Versions”). 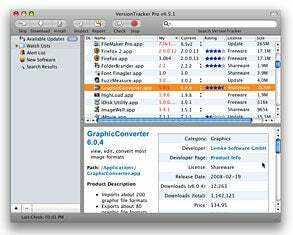 VersionTracker Pro makes keeping your software up-to-date easy. It monitors www.versiontracker.com and alerts you when new versions of your installed programs become available. One caveat is in order here. On rare occasions, an update will introduce bugs or incompatibilities. So some people prefer to wait a few days before installing new versions of software—especially OS X updates—to see whether the “early adopters” have any problems. A good compromise is to install security updates immediately but wait a bit for other types of updates. How Often Set Software Update, and any other automated utilities or built-in update locators, to check for updates weekly. If you’re checking manually, do so every few weeks for software you use frequently. A hard drive is an amazing collection of technology: a few small platters, motors, and sensors can store gigabytes of data very reliably. But the technology isn’t perfect, so you need to give your drives periodic checkups. Check Your Directory Files are written to and erased from your hard drive by the thousands, or even the tens of thousands, each day. Over time, the directory—data on your drive that keeps track of exactly where each file is stored—can become fragmented, which means that it’s split into sections across your drive. This not only impairs performance, but can also damage the directory and make it inaccurate. Checking the directory periodically, and optimizing or repairing it when necessary, is one of the best ways to avoid system problems and data loss. Apple’s Disk Utility (in /Applications/Utilities) can do basic directory maintenance. Launch the utility and select your hard drive in the list on the left. Click on the First Aid tab and then on Verify Disk. If Disk Utility tells you that the volume needs to be repaired, you can do so by booting from your OS X Install disc. Insert the disc, press and hold down the C key during startup, and then, once you see the Installer window on the screen, access Disk Utility via the Installer’s Utilities menu. If you don’t have that disc or another bootable OS X volume handy, you can also use Safe Mode or single-user mode at startup to repair the directory (see “Leopard troubleshooting guide”). A more-thorough option is to use Alsoft’s $100 DiskWarrior 4.1( ), which has long been the gold standard for directory fixing. Instead of trying to repair your existing directory, the utility examines that directory, scours your hard drive for files and folders, and then creates a new, optimized directory. Like Disk Utility, DiskWarrior requires that you reboot from the DiskWarrior CD, or a different hard drive containing the program, to repair your startup disk. Watch Your Hardware Of course, if your hard drive’s hardware is failing, the best directory in the world won’t matter. To help you keep an eye on your drives’ status, today’s hard drives include Self-Monitoring Analysis and Reporting Technology (SMART). This feature monitors a slew of performance indicators inside the drive and then determines whether the drive is operating normally. That status—OK or Fail—is made available to your computer and its software. If a drive’s SMART status is Fail, you should immediately back up your data and replace the drive. The problem with SMART is that you need to run special software that works with SMART in order to see a drive’s status. Disk Utility displays each disk’s SMART status at the bottom of the Disk Utility window, but opening Disk Utility just to check SMART status is a hassle. An easier approach is to use a utility that monitors SMART status in the background and alerts you if a drive’s status changes. Commercial disk utilities such as DiskWarrior, Micromat’s $98 upcoming TechTool Pro 5, and Prosoft Engineering’s $99 Drive Genius 2 provide such automatic monitoring. Core Code’s free SMARTReporter 2.3.7 also works well. SMART also has a couple significant limitations. First, the technology works only with drives connected to your computer via IDE/ATA, SATA, and (sometimes) eSATA interfaces; this means it won’t alert you to potential problems with FireWire or USB drives. Second, because SMART detects minor changes over time, it can’t protect you against sudden drive failure. Still, according to drive manufacturer Seagate, the majority of drive problems involve the sort of gradual degradation that SMART can detect, so it’s worth using. How Often Check your hard drive’s directory once a month and repair as needed. Use a utility to set up automatic SMART monitoring. OS X is so stable that most people can go weeks or months without having to restart their Macs, and many do. Although this is convenient, it has drawbacks. For one, the more programs you launch and quit, the more OS X’s virtual-memory system has to swap data to and from the hard drive. In addition, some programs have memory “leaks” that cause them to use more and more memory over time. The result is that your Mac may seem slower after it’s been running for a few days or weeks than when you first booted up. When it comes to programs that grab more and more memory over time, perhaps the biggest offenders are Web browsers. The longer they’re running, the more RAM they demand. Eventually, they can bog down your Mac’s overall performance. How Often Restart your browser if it’s been open for a while and you notice your Mac slowing down. Today’s hard drives hold more stuff than ever, but we also seem to be finding more and more stuff to store on them. And if your hard drive gets too full, performance can suffer. What’s worse, if OS X tries to save user data, virtual-memory files, or temporary files to your hard drive and can’t find enough free space, you can lose data. How much free space is enough? This is a point of frequent debate, but my personal guideline is approximately ten percent of your hard-drive capacity or 10GB, whichever is less. In addition, if you work with programs that store large temporary files—for example, Photoshop needs scratch space, and DVD-burning software generally requires free space equal to the size of the disc you’re burning—be sure to leave more room for that. You might also have space-hogging files and folders you’re not aware of. My favorite tools for finding them are Eriban’s free GrandPerspective 0.9.3( ) and ID-Design’s $13 WhatSize 4.2( ). Both utilities scan your hard drive to show you which files and folders are taking up the most space. WhatSize’s column view is better for finding the largest files and folders in each directory, while GrandPerspective’s graphical interface lets you quickly spot the largest files—or groups of files—on your drive (see “Find Your Biggest Files”). Once you’ve located the worst offenders, you can free up drive space by deleting the unnecessary ones (but never delete something if you don’t know what it is). 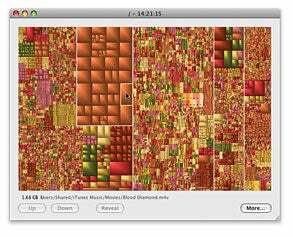 GrandPerspective can give you a graphical view of what’s hogging your hard-drive space. Empty the Trash Your Mac’s Trash is easy to empty—just control-click on its icon in the Dock and choose Empty Trash. But some people never do so, ending up with gigabytes of unwanted data on their drives. If you tend to forget, set up a repeating event in Apple’s iCal (/Applications) to remind you. (The downloadable Macworld Maintenance Calendar includes one.) Alternatively, check out Fastforward Software’s $20 Compost 1.9( ), a utility that provides many options for automatically processing deleted files. How Often Clean up your hard drive every few months, or whenever it starts filling up. And don’t forget to empty the Trash occasionally.